Notebooks and cursive help writer's block. Silly Mainer. I carry an umbrella in my heavy backpack. Always had one in the car, as well as a towel. 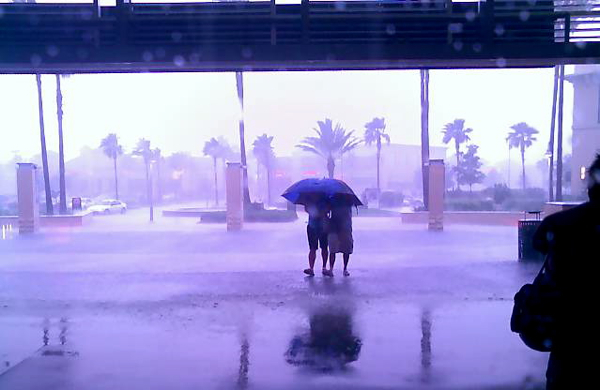 It's summertime in Fla-la-land, which means afternoon rainstorms. WALL-E was so freakin' adorable. And the message was superb. I wonder if Sigourney Weaver used clips from "Galaxy Quest" to audition for her role. Welcome to FL in the summer. Rain every afternoon. Damn writer's block. The bane of our existence as scribes. I never thought to blame it on humidity, but now I see that water particulates are to blame. Boss Greg passed around a piece from the NYT about the fact that the Newseum does not have a section -- or anything -- on copy editing. You should take a look at when you get a chance if you haven't seen it already.